Burgess: Inspired call or unnecessary gamble? Over 6 foot tall and weighing just over 18 stone, Sam Burgess is an intimidating figure. Having enjoyed huge success and garnered cult hero status in Rugby League, Burgess decided to switch codes in the summer of 2014 and naturally with such an exciting prospect moving over to Union just over a year away from a home World Cup, tongues were soon wagging. Could a Rugby League star really adapt to a new code and force his way into international recognition in such a short space of time? The answer – a somewhat unconvincing yes. While Burgess has made the cut he has done so by the skin of his teeth after a challenging first year in Union. Following his arrival at Bath, coaches soon had to find the best position to get the best out of this exciting new talent. A hugely physical presence with raw power, the dilemma over Burgess for the Bath coaches centred around whether he was a forward or a back? With England seemingly struggling to find an effective centre partnership approaching the World Cup, the decision was made to play Burgess at centre to see whether he could provide the same sort of contribution that has seen Jamie Roberts excel with both Wales and the British and Irish Lions. However after a difficult few opening games in which Burgess struggled to get to grips with his role, and with competition coming from more-natural centres like Kyle Eastmond and Jonathan Joseph, Bath soon moved Burgess into the back-row as a blindside flanker. His move from back to forward seemed to be a masterstroke from Bath head coach Mike Ford as Burgess filled a gaping hole at No.6 for Bath by providing a great balance of defensive resilience along with a powerful running game that provided his team with a different attacking outlet. As he gradually made the No.6 berth his own, Bath stormed through the regular Premiership season, playing a mesmeric brand of attacking rugby that saw them reach the Premiership final, where they eventually lost to Saracens. Despite the disappointment of losing a Premiership final, Burgess had shown throughout the season his capabilities to play Union and seemed well on course to achieving his goal of making the England World Cup squad. Following his stellar first season with Bath, it was no surprise to see Burgess included in England’s preliminary training squad for the World Cup. However when England coach Stuart Lancaster came out to publically announce that Burgess would be considered as a centre rather than the flanker position which he had made his own at Bath, the stakes grew. Not only would Burgess have to adapt to a different position once again, he would also be up against seasoned centres such as Henry Slade, Luther Burrell, Billy Twelvetrees and his Bath teammates, Joseph and Eastmond. With Lancaster seeing no room for Burgess at No.6 due to the form of Tom Wood and James Haskell, the England coach felt Burgess’ best way of making the squad would be as a back. Given his long-awaited debut at Twickenham against France playing at inside centre, the game itself proved a mixed bag for Burgess with him providing some extra bulk in defence, but also let down at times by some poor decision-making including a yellow card, as England took the win 19-14. Burgess was not selected in the return fixture in Paris as England lost narrowly to leave Lancaster with some tough calls regarding his centres. With Brad Barritt and Jonathan Joseph guaranteed their spots on previous form, and Henry Slade having worked his way into contention, the big call came down to Burrell and Burgess. An agonising decision given the qualities that both players possess, Lancaster took the decision to select Burgess over Burrell. For many the decision to take Burgess instead of Burrell is a strange decision. 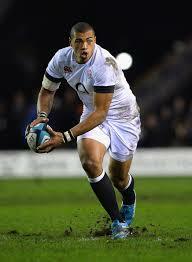 Bursting on to the scene in the 2014 Six Nations at outside centre, Luther Burrell scored three tries in the tournament and was arguably England’s player of the tournament. Roll on a year and now firmly established as an international centre, Burrell moves across to play at inside centre and once again proves his credentials as he forms a solid partnership with new star Jonathan Joseph, as England come agonisingly close to winning the 2015 Six Nations. At this time, the thought of Burrell not making the World Cup squad seemed unimaginable for many, with his performances at both 12 and 13 for England over the last 18 months making him one of England’s most reliable players. However despite his early success in an England jersey, it may have been a game for Northampton which decided Burrell’s World Cup fate. In January 2015, Burrell’s Northampton went up against Racing Metro in the European Champions Cup. Needing a win to overtake Racing and top their group, much was expected of Burrell as he matched up against Welsh centre Jamie Roberts in a contest which looked like a dress rehearsal ahead of the World Cup for the rival centres. With England and Wales to meet in the pool stages, the battle between Roberts and Burrell proved an interesting sub-plot. For Burrell however, the match proved to be a nightmare as Racing ran riot, thumping the Saints 32-8 with Burrell himself unable to contain the threat of Roberts who proved crucial in the victory for the French side. With the Six Nations soon to follow and with the World Cup still months away, Burrell had time on his side. Despite this, the fact that Roberts had dominated Burrell in such brutal fashion did not bode well for the Englishman, and you wonder whether had the outcome of that match been different, would Burrell have made the squad? In contrast, Burgess had an advantage over his rival as with his extra physicality, the former League star could potentially prove to be more of a match for Roberts with England and Wales due to meet early on. Along with this, the fact that England also face Australia in the pool stages may have also influenced Lancaster’s thinking. With Rugby League more popular than Union in Australia, Burgess’ success down under playing League could provide England with a psychological advantage, with many Australians already aware of just how good Burgess can potentially be.